1. P-400 of 39 FS, 35 FG, 5 AF, 12 Mile Aerodrome New Guinea, 1942, personal aircraft of Lt. Eugene Wahl. 2. 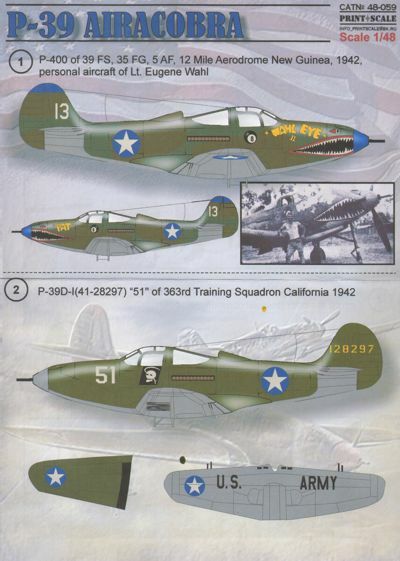 P-39D-I(41-28297) "51" of 363rd Training Squadron California 1942. 3. P-39D-I (41-38350) "P" of 35 FS, 8 FG, 5 AF, Milne Bay, New Guinea, October 1942. Personal aircraft of pilot Lt. I. A. Erickson. 4. P-400 "80" "Pepper" of 67 FS, 347 FG, 13 AF, Guadalcanal, end of 1942. Aircraft in rather unusual camouflage. 5. P-39N-5 (218738) "A" of GC I/4 "Navarre", 1944.